ABOUT US All about Membership, Mike Ackrill award, Committee the President, etc. To be held on the 25th April 2019, see details on the NEWS page of this web site. 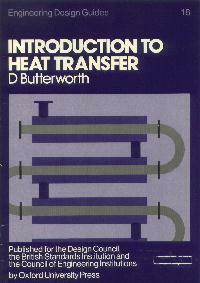 Dave Butterworth, in conjunction with the Heat Transfer Society, is making his book, "Introduction to Heat Transfer" available for free via this web site. This book is available to download as a pdf file. Please note that this is an image-based pdf and is therefore very large. The size is 22.7 MB. Click here to download. We are always on the lookout for interesting Forum Evening topics. Please do let us know if you have something you want to tell us about in heat transfer. This might include, information on new heat exchangers or new uses of existing exchangers, R&D developments, new software or standards, or, indeed, anything that will interest our Members. Email us with your ideas. Forthcoming forums are listed on the Events page. hts provides a service whereby Members may receive Newsletters, events notices and other information by e-mail rather than by normal mail. To start receiving information by this way, e-mail Colin Weil with your name, e-mail address and, if you know it, your hts Membership number. Click here to become an hts Member. For all enquires about membership, you are welcome to email us at membership@hts.org.uk.